Erik Rush was born in New York City on January 1, 1961, the first child of a white father and black mother. For many years his family lived in the same neighborhood as Betty Shabazz (Malcolm X’s widow) and her children. His mother also founded a prominent African dance and drum troupe in New York; thus, Erik grew up keenly aware of the unfolding cultural issues of the day. Erik has a background in music, martial arts, biomedical research, and business. He holds a Bachelor’s degree in Business Management (with a minor in Criminal Justice) from Liberty University. He is an author and contributor of social commentary to various print and online publications. He has appeared on Fox News, CNN, and is a veteran of innumerable radio appearances and speaking engagements. In February of 2007, Erik was the first to break the story of then-Senator Barack Hussein Obama’s ties to militant Chicago preacher Rev. Jeremiah Wright on a national level. 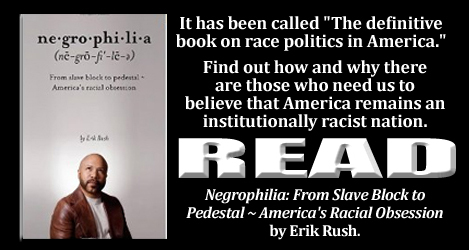 His latest book, Negrophilia: From Slave Block to Pedestal – America’s Racial Obsession, is available on Amazon.com and other places books are sold. 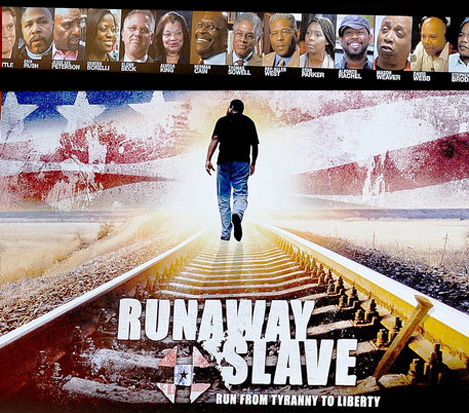 In Runaway Slave, Rev. C.L. Bryant and leading black conservatives (including Erik Rush) demonstrate that it is time for a new Underground Railroad to help liberate all Americans from the Government plantation that has left the black community dealing with a new form of slavery: entitlements.